If Hemel Storm beat Derby Trailblazers at Hemel Leisure Centre on Saturday and other results go to form they will qualify for the NBL Championship Play-Offs for the fifth time since winning promotion to the top flight. After Storm’s comfortable 92 – 74 win against the Magic in Manchester on Saturday and Sunday’s 98 – 89 loss to Loughborough Riders the next day Hemel sit ninth in the Division One table and are still in the battle for one of the last two coveted Play-Off spots that will be decided this weekend. Vanarama-sponsored Storm and three other Clubs – Essex Leopards, Bradford Dragons and Leicester Warriors – are all potential qualifiers in either seventh or eighth places. But a victory on Saturday against the already Play-Offs bound Trailblazers, who Hemel beat 98 – 92 earlier in the season, means Storm will most likely finish seventh and face Worthing Thunder away in the quarterfinals. Storm last played Thunder in early February and came away from the south coast with an upset 114 – 109 double overtime victory. Hemel’s home advantage for Saturday’s game is not lost on Storm Head Coach Robert Youngblood: “It’s still in our hands. We need the best fans in the country – the Storm Troopers – to come out and help us get over the line”. Storm kept their focus on Saturday after a slow start saw them fall behind 11 – 6 in Manchester before stepping up the intensity of their defence and sharing the ball on offence to go on a 14 – 0 run and take a 22 – 15 first quarter lead that they never relinquished. The already relegated Magic squad could not cope with Storm’s rebounding effort or their fast breaks but they were able to stay in touch holding the visitors advantage to just eight points (44 – 36) at half-time. Another strong spurt after the interval saw Hemel quickly grow their lead to 20 points and cruise down the stretch to an important win led by impressive performances from their three former BBL players - 27 points and 10 rebounds from TrayVonn Wright, Blayne Freckleton with 24 points that included four triples, and Levi Noel who finished just short of a triple-double with six points, 13 rebounds, nine assists and four steals. On Sunday an explosive first quarter saw the Riders with the early advantage leading by as many as 12 points midway through the period. But Storm found their scoring touch late in the quarter to tie things up at 33-33 as both sides set their stalls out with eye-catching offensive displays. 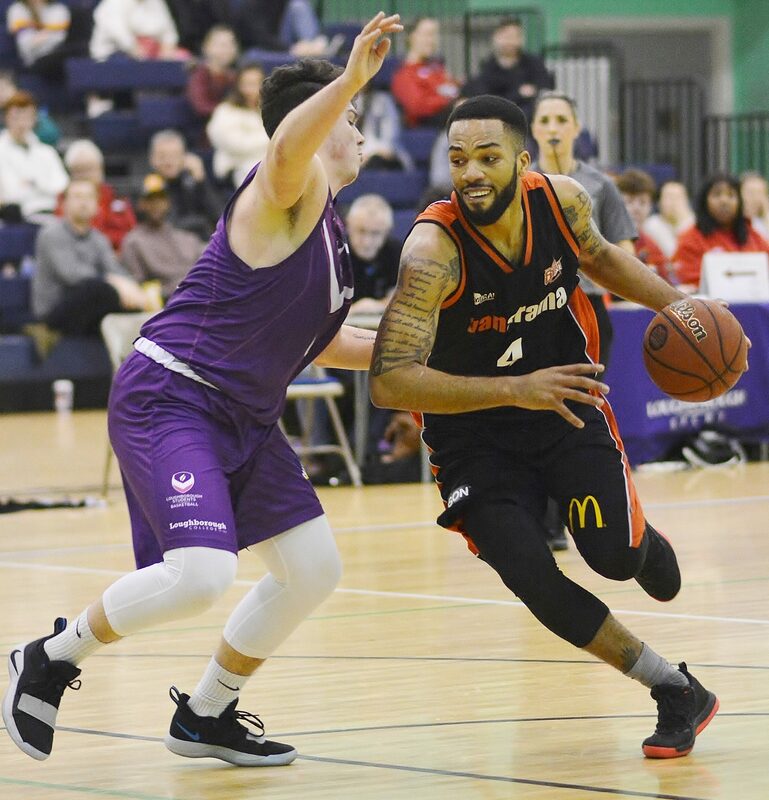 And despite Hemel’s American star TrayVonn Wright being shackled by the home team and restricted to just nine points in the game Storm led throughout the second stanza and held a 56 – 51 advantage at the half-time break. Hemel’s offence misfired in the third period as Loughborough stepped up their defence to hold their opponents to just 12 points in the quarter and get themselves back into the contest. With just over five minutes remaining, Freckleton cut the Riders' advantage to a single point with a triple before a confident 8-1 run gave Loughborough the edge heading into the final two minutes. Another Freckleton score from down-town made it 92-87 with 42 seconds on the clock but Loughborough’s Lucien Cristofis hit four from four free-throws in the closing stages to maintain Loughborough’s lead to the buzzer. A disappointed Coach Youngblood said: “We had to bounce back against Loughborough after they beat us only two weeks’ ago by 42 points. “We made some changes to our approach for this game but in the end we gave up seven offensive rebounds down the stretch – and they made shots, we didn’t. Storm was led by 27 points, five rebounds and two assists from Bode Adeluola, while Blayne Freckleton had 20 points, four rebounds and three assists. Levi Noel added 12 points, eight rebounds, five assists and two steals, and captain Tom Adorian chipped in eight points and five rebounds. Crucially, TrayVonn Wright was limited to nine points on four from sixteen shooting as the former BBL Leicester Riders man found it tough to impose himself on his former club’s Division One squad but he still contributed nine rebounds, five assists and four blocks. .
Storm team and scorers v Manchester: TrayVonn Wright 27, Blayne Freckleton 24, Bode Adeluola 12, Tom Adorian 10, Will Ashby 9, Levi Noel 6, Jamie Hayes 2, Jack Burnell 2, Shaquille Lewis. Storm team and scorers v Loughborough: Bode Adeluola 27, Blayne Freckleton 20, Levi Noel 12, TrayVonn Wright 9, Tom Adorian 8, Will Ashby 5, Jamie Hayes 5, Jack Burnell 3.
on Saturday at Hemel Leisure Centre. Photo caption: Storm’s Levi Noel – a near triple double against Manchester Magic.